“ Ah, smells good, I wanna eat it. Chen Zigui is a character in IDOL∞INFINITY and a member of the idol group Year 5 Class 6. A 11-year-old primary schooler. Chen Zigui is a carefree student, who is compared to a small animal. The most important thing to her is eating, so she is always asking "Can I eat this?" or "Is it tasty?" She has a very straight forward thought process, and tends to notice things that others would miss. She's good friends with Li Xueyang. Zigui has a personality that can only be described as odd. 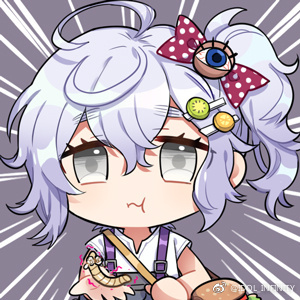 She loves food, to the point where she joined Year 5 Class 6 immediately after Xiaowei gave her some food and seemingly only talks when food is involved. In fact, she constantly drools, indicating she's hungry during most hours of the day. It is implied she also likes to eat things people would not normally eat, like living worms. Her love for food even effects her thoughts, resulting in her straight-to-the-point mindset. Zigui, seeing a doughnut, decided to follow it to its location. It is revealed that the person manipulated the toy was Wu Xiaowei, who also lured Li Xueyang with a Princess Fiora Toy. Liu Siyuan smacked Xiaowei with a book and demanded her to be nicer, since she manipulated the two recruits. Zigui ate the doughnut straight from Xiaowei's hands, which grossed out Xiaowei. With the unit complete, they took a celebratory selfie together. Birthday messages from Zigui's fellow unit members. Zigui is the only character that has yet to have said words in the comics, only making an "ahhh" sound while eating gumballs.